One of the most important gear for a motorcyclist is helmet, as it protects what is most vital on a motorcyclist - the head. 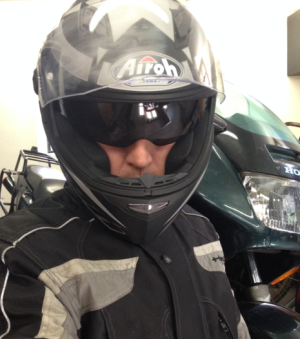 During the late summer I have tested an "Airoh Movement Shot" helmet, which this product test is about. Well, a bit about me. I am motorcycle rider who has been riding motorcycle for approx 28 years, and tried a few helmets. I ride a Honda VFR 750F and likes touring and riding hard i corners. The previous helmets I have used earlier are flip-up helmets, so it is rather new to me to try the a closed full-face helmet. I am impressed. The first time I had the helmet on, I had a feeling as the helmet was made exactly for my head. I felt the weight of the helmet was comfortable light and it was easy to operate the visor and the built-in sunglasses. It is a pleasure riding with the helmet. I better elaborate why the helmet is a pleasure, but first a few words how I have evaluated and testet the helmet. My main focus is to test like any user will do, where the focus is not so much on the technical issues, but simply the user experience. The most important issue with any helmet is the protection when crashing. Fortunately, I have not got any experience within this with the Airoh helmet, but I rest assured the helmet fulfills the most demanding standards, even the external shell of the helmet is made of termoplastic. Below find the evaluation criteria and the result. It is a nice designed helmet with built-in sunglasses. Especially the sun glasses is a very neat feature, as I very often ride with the sun glasses. This might be because I not so often ride in rain.... When the sun glasses are built in, there is no discussion wheter it is possible to get sunglasses on or not. After all the years with a flip-up helmet it is time to learn new tricks how to get the helmet on without having your ears ripped off. After only a few try's I managed this, and the helmet get's on with no problem. Just note, that I have for the last 25 years only used flip-up helmets. When I got the helmet, it was of course still in the box and I thought something was wrong. Can a helmet and a box be that light? Yes, that is for sure possible. The weight is 1 420 gram which is in the low weight range. When using the helmet, it also feels light. Noice in a helmet is a common and important issue to discuss, and to me it is one of the most important issues, as I am very sensitive to noice. That is why I always wear ear protectors, and can clearly hear the noice level is lower than compared to my old flip-up helmet. Still I use the ear protection when riding my motorcycle, but the noice level is lower. Full face helmets are also known for lower noice level, but still I am very satisfied with the Airoh. Riding in some pouring rain simply is just a part of life as a motorcyclist. It is important the helmet does not get wet and water and fog on the inside of the visor. It is impossible to avoid, but the Airoh manages fairly well, as I just opened the helmet a bit to get some ventilation. This kept the visor fairly free of fog. I ride mostly in dry weather so to open for some ventilation and not to breathe directly on the visor is the best option for me. So for me it is not necessary to mount the extra fog shield protection. In the box is also a wind breaker. I have been riding without is, and really not felt it was necessary. Just mounted the wind breaker to try it, and it looks OK and is no obstackle when taking the helmet on. The price is very attractive, as when testing in summer 2014 the price is approx only DKK1800 // EUR240 when purchasing by www.duells.dk which leaves the helmet on an absolute price attractive level, and compared to the quality, the price/quality ratio is very attractive and competitive. As mentioned, the helmet appears to be made for my head. However, it is only after some hours riding your motorcycle that you really can feel if this is true. It is. The only thing I noticed was the cheek pads are just a bit too big for me. Well, that is a small issue, and I think I will manage it. It is a pleasure the helmet have different steps in which the visor can be opened during the ride, and the visor stays in the same position even when riding highway speed and turning the head looking behing before pulling out for passing a car. 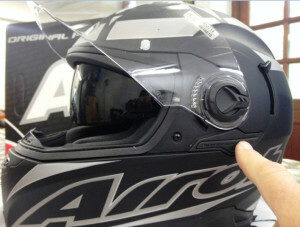 So the next task for me is to mount the Cardo communication in the new helmet. It has done well in the old helmet, and now my wife and I cannot ride the motorcycle without it. Here you can read a test of the Cardo communication system - click here to read Cardo Scale Rider Q3 test.